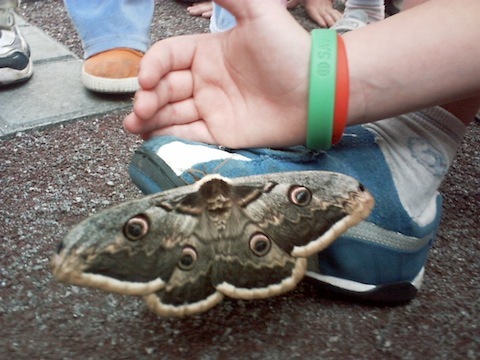 It’s Europe’s largest moth, but not quite as large as the photo makes it look; that is a child’s foot. But still, it can have a 6″ wingspan, which is pretty good. 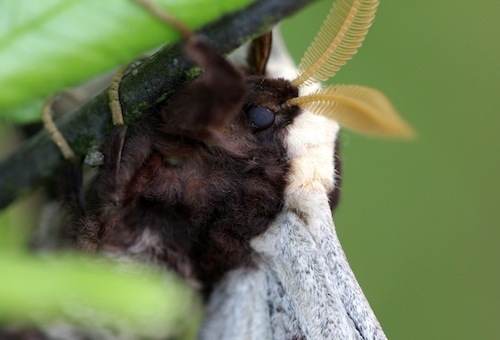 On the morning of the 6th of May a female emerged from her cocoon in my presence on my laboratory table. I cloistered her immediately, all damp with the moisture of metamorphosis, in a cover of wire gauze. I had no particular intentions regarding her; I imprisoned her from mere habit; the habit of an observer always on the alert for what may happen. We had to go downstairs to reach my study, which occupies the right wing of the house. In the kitchen we met the servant; she too was bewildered by the state of affairs. She was pursuing the huge butterflies with her apron, having taken them at first for bats. It seemed as though the Great Peacock had taken possession of my whole house, more or less. What would it be upstairs, where the prisoner was, the cause of this invasion? Happily one of the two study windows had been left ajar; the road was open. Candle in hand, we entered the room. What we saw is unforgettable. 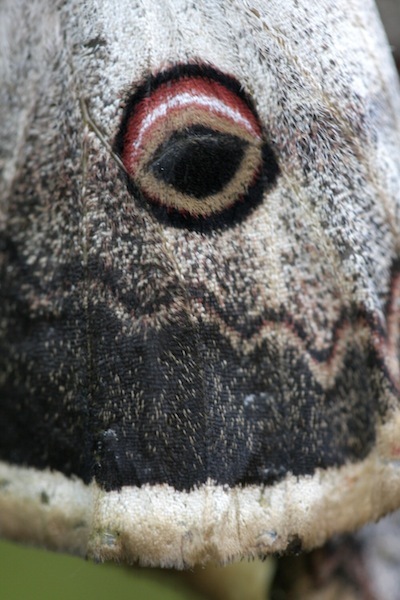 With a soft flic-flac the great night-moths were flying round the wire-gauze cover, alighting, taking flight, returning, mounting to the ceiling, re-descending. They rushed at the candle and extinguished it with a flap of the wing; they fluttered on our shoulders, clung to our clothing, grazed our faces. My study had become a cave of a necromancer, the darkness alive with creatures of the night! Little Paul, to reassure himself, held my hand much tighter than usual. How many were there? About twenty. To these add those which had strayed into the kitchen, the nursery, and other rooms in the house, and the total must have been nearly forty. It was a memorable sight—the Night of the Great Peacock! Come from all points of the compass, warned I know not how, here were forty lovers eager to do homage to the maiden princess that morning born in the sacred precincts of my study. 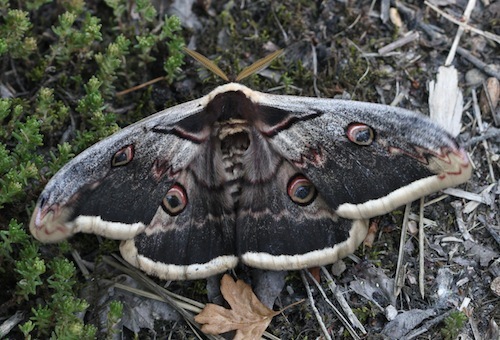 I actually remembered this story being about the Giant Peacock Moth’s slightly smaller relative, the Emperor Moth, probably because the Emperor Moth is found in Britain and the GPM isn’t (I’ve personally never seen either of them). Which is if anything even more beautifully marked. * despite the occasionally clunky translation; can ‘Put on your togs, kiddy!’ really have been good idiomatic English even in 1911? » ‘Saturnia Pyri tximeleta erraldoia’ is © Marije, Peru eta Lili and used under a CC by-sa licence. The other three (1, 2, 3) are © Photo Nature and used under a by-nc-sa licence.